Reputedly this was Barcelona’s first church, built in the 4th century over the Roman amphitheatre, and legend has it that Catalonia’s totem black Virgin was kept here before she was relocated to Montserrat for safety from the Moors. Founded or refounded by Charlemagne’s son, Louis the Pious, in 801, it is the last church in Spain to preserve the ancient privilege of Testimentos Sacramentales (Sacramental Wills) bestowed by Louis himself. This gives any citizen of Barcelona the right to make a will, orally, without a notary or writing on paper, before the altar of Sant Feliú. The present church dates from the 14th century, but its austere façade (made more austere by a rusting metal door) was added in 1883. 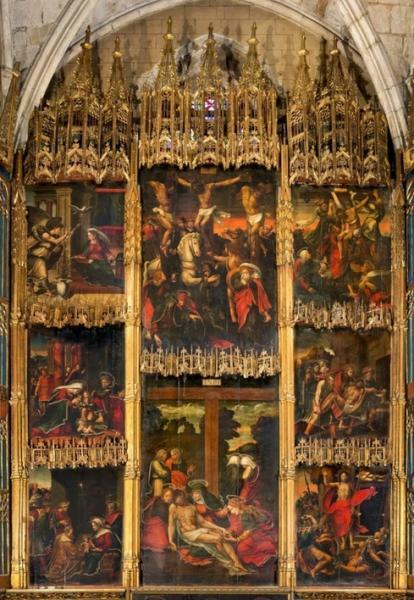 Inside, there’s a fine 16th-century retable by the Portuguese painter Pere Nunyes in the Capella Sant Feliú, lovely 14th-century stained glass and Visigothic capitals, pressed into service as fonts. If the interior looks familiar, it was used a set in the 2006 film Perfume: the Story of a Murderer, pretending to be the cathedral of Grasse, in France. (The exterior wasn't good enough for the director, so they shot those scenes at Girona cathedral). They turned some of the nearby streets into a market for the film, and shooting took so long they wasted two tons of fish and a ton of meat—people could smell it six miles away. The public fountain in the square was Barcelona’s first since Roman times. It was donated in 1367 by Joan Fiveller, a merchant and councillor who lived in C/ de Lledó; in Barcelona lore he is celebrated for standing up to a king, when he forced the retinue of Ferdinand of Antequera to pay tax on the salt cod they consumed in the city. This was such a signal victory of Catalan usatges over royal privileges that the Ajuntament put Fiveller’s statue in place of Hercules on its façade. Fiveller also discovered the water source in the Collserola while hunting, and had the water pumped into the city—hence his falcons, who keep Sant Just company on the fountain.